High spinal cord injury is the most formidable of all non-fatal injuries producing profound physical disability and radical change in the pattern of life of the sufferer. The dysfunction is not just confined to motor power. The totality of physiological disadvantages consist of sensory deprivation, abolition of bladder and bowel control and sexual function, autonomic decentralisation with deranged thermoregulation and a fragile homeostasis. Almost invariably there is no major mental or emotional deficit due to brain injury and it is this that makes spinal injury a particularly distressing experience. Lack of cosmetic disadvantage, an essentially non-progressive neurological dysfunction and, during the past three or four decades, an exceptionally good life expectancy, have made people with spinal cord injury more in control of their lives than most others with serious physical disability. Such control of life, not unnaturally, increases expectation and discernment of the medical treatment that is offered. 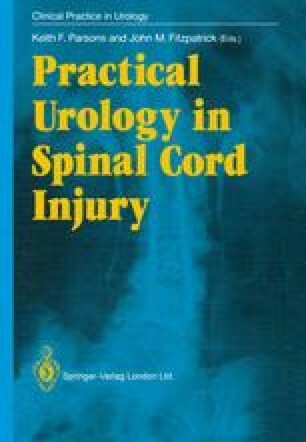 It is of concern that this challenge is not always effectively met by the medical profession due to lack of insight into the complex physiological changes produced by spinal cord transection and its social and economic implications.